Anyone that suffers from dry and cracked lips understands that they are painful and embarrassing. If your dry lips are becoming a problem, you can make a homemade lip exfoliator with a sugar lip scrub. Lip scrubs for chapped lips are a natural and effective solution to your problem. Read on to learn how to make your own. 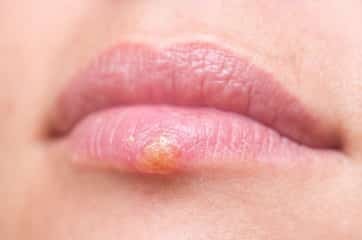 What Causes Dry and Cracked Lips? According to the experts at Healthline, lack of moisture is one of the main causes of chapped lips. Like other parts of your skin, lips don’t have any oil glands, which make them more likely to drying out and cracking. During the winter months, the humidity in the air is low. Without the added moisture in the air from humidity, your lips can get dry. On the flip side, summer months can also cause cracked lips. Extended periods of sun exposure also causes dry lips. Many people with chapped lips think that they can self-medicate by licking their lips to keep them moist. However, this is not the case. Saliva can strip moisture from your lips. If you lick your lips constantly, you’ll suffer from dry and cracked lips. Ultimately, licking your lips worsens the existing problem. Why Use a Sugar Scrub? A simple sugar scrub can act as a natural lip exfoliator. Lip scrubs help remove the dead surface of your lips, which brings out new layers that are fresh, soft, and smooth. A homemade exfoliator will also aid your lips in retaining moisture for longer periods. By retaining moisture, the DIY sugar lip scrub prevents dry and cracked lips. When you make your own lip scrub, you should use it at least once every week. You’ll likely need to use it more frequently during the winter months. It’s easy to add a sugar scrub for lips to your routine because it only takes a couple of minutes. Although the idea may sound complex, we’ll show you how to make lip scrubs at home. One of the main benefits of a DIY lip scrub is the cost. A lip scrub recipe is extremely cost efficient, and many of the ingredients are already in your kitchen. These ingredients create a safe and natural lip scrub that prevents drying and cracking. Are you ready to make sugar lip scrub? We’ll let you know the most popular ingredients that you should consider using for your homemade lip scrub. You can learn how to make a lip scrub with simple items found in your kitchen. Honey helps lighten dark areas of your skin. It acts as a bleaching agent that makes your lips look younger. Honey will help make your lips feel smooth, soft, healthy, and nourished. All of these qualities make it a great candidate as a popular ingredient that you should consider for your lip scrubs. Coconut oil helps hydrate your dry and cracked lips. It contains minerals that add moisture to the skin and, which makes them feel soft and smooth. Using coconut oil in your lip scrubs will help eliminate dry lips and prevent them from cracking again in the future. Furthermore, coconut oil has a smell and taste. Just try to avoid licking the tasty flavor off your lips, because saliva will only make your problem worse. Castor oil is also a moisturizing agent. It also acts as a natural exfoliator. Castor oil contains ricinoleic acid, which is great for exfoliating acne. The same concept can apply to your lips. It opens pores to keep your lips hydrated, soft and nourished. You may want to consider using castor oil as a staple base ingredient to your lip scrubs. Coffee grounds are another great ingredient that you can consider adding to your lip scrub. It helps remove and cover up any blemishes on your lips that are associated with cracks and dry skin. If you’re a coffee lover, it’s also a pleasant and familiar taste. If you enjoy drinking coffee, consider adding some coffee grounds to your lip scrub recipe. Citrus helps remove dead skin cells. The acid helps cure skin that is dry and cracked. Find a way to incorporate citrus fruits such as lemons, limes, oranges, and grapefruits into your lip sugar scrub. Cinnamon helps make your lips plump and luscious. When your lips dry out and crack, they start to thin out and look unappealing. Adding cinnamon to your lip scrub can make your lips fuller to look larger and vibrant. Like cinnamon, peppermint also helps plump your lips. Peppermint essential oil can help your lips appear fuller and repair the damage associated with dry and cracked lips. It also adds a fresh mint flavor to your scrub. Vanilla is a natural sweetener. It’s an appealing taste to add flavor to your lip scrub. Since it’s a natural ingredient, it won’t cause any harm or further damage to your dry and cracked lips. There are three main types of sugar that you can use for your lip scrubs. Each type of sugar will create a slightly different consistency than others. We’ll explain the benefits of each type of sugar so you can determine why one may be better suited for you than others. Raw sugar creates a rougher scrub texture for your lips. If you want to exfoliate your lips, raw sugar is probably your best option because of the consistency. A brown sugar lip scrub will be softer than the other types of sugar. Different shades of brown sugar indicate how much molasses is mixed in with it. For example, light brown sugar may contain about 3.5% molasses while dark brown sugar could have up to 6.5%. If you want to create a softer scrub for your lips, consider using brown sugar. During processing, white sugar creates different sized granules. You can get it in a crystal or powder form. To creating a lip scrub, you should consider finding some organic white sugar because of its natural properties. 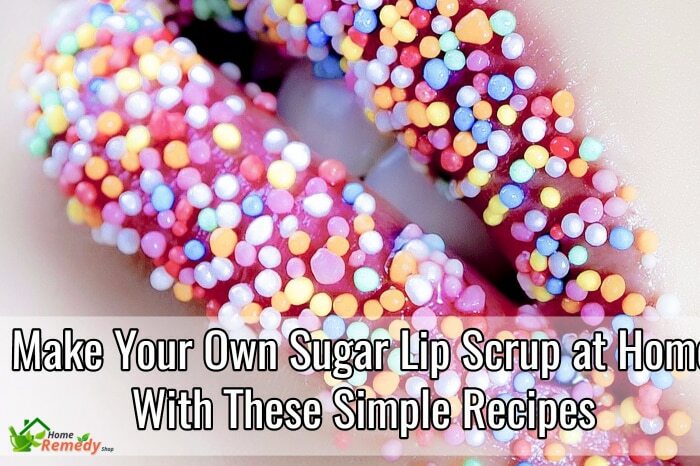 Here are some sugar lip scrub recipes you can try. For this idea, you’ll need honey, brown sugar, and either olive oil or coconut oil. If you don’t have honey in the house, you can replace it with another similar liquid sweetener. Mix the three ingredients together in a small bowl. Using your fingers, apply some of the scrub to your lips. 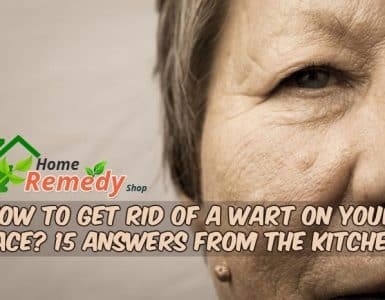 Gently rub it on for up to two minutes. If you have time, let the scrub stay on your lips for an additional two minutes. Wipe it off your lips with a clean, soft, warm cloth. You can store the excess scrub in a closed container. Keep the container in the refrigerator to extend its shelf life. You can tell if the concoction has spoiled by smelling it before you use it. If it smells nasty or rancid, just throw it away and make another. First, gather your ingredients. 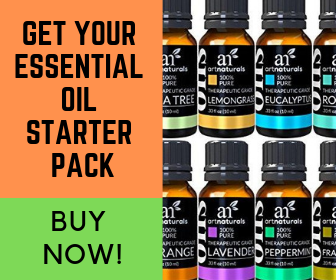 You’ll need two tablespoons of sugar, one tablespoon of castor oil, a half teaspoon of cocoa, half teaspoon of coffee grounds, and three drops of peppermint oil extract. The castor oil is the base of the scrub, and the sugar gives it the proper consistency to create a scrub texture. If you don’t have any castor oil readily available in your home, you can use olive oil or jojoba oil as an effective replacement. Once you mix everything together, it should create a mint flavor and smell. It’s a great option to use in the winter months around the holiday season. If you love fall flavors and pumpkin pie, you can make lip scrub that emulates these familiar flavors, and use it all year round. Gather two tablespoons of coconut oil, a tablespoon of honey, a tablespoon of brown sugar, and a teaspoon of pumpkin spice. Mixing these ingredients should create wet consistency for your scrub. Keep the scrub in a covered jar and place it in a cool, dry location to preserve it for future use. Gather your ingredients. 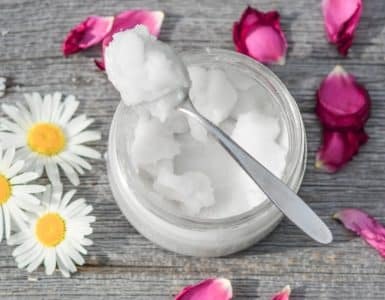 Start with three tablespoons of organic coconut oil, five tablespoons of evaporated cane juice sugar, vanilla oil in jojoba, and peppermint oil. Mix the coconut oil and evaporated cane juice into a bowl. Next, add eight drops of the vanilla oil and then four drops of peppermint oil. Use a fork to combine everything and work them together. It should only take you about five minutes to prepare this lip scrub. Once everything is mixed, you can transfer it to an airtight container and store it at room temperature. When you’re ready to use the scrub, just apply a pea-sized amount to your lips. Use a warm towel to wipe if off after several minutes of scrubbing.